Spot bioluminescent fireflies, trek to the Prabalmachi, stay in alpine tents pitched at a beautiful campsite and escape into the forests of the Western Ghats. On this fireflies trek to Prabalmachi, you’ll trek through dense wilderness to explore the trees, shrubs and bushes of the Western Ghats. En route, you’ll spot several bright, yellow fireflies that nestle in the monsoon-fed forests of Prabalmachi. A sight to behold, especially in the darkness of the night, these twinkling fireflies will adorn your trail to Prabalmachi. Another highlight of the trip, you’ll come back from an exhilarating trek and have fun with your fellow campers with campfire stories before drifting into sleep inside alpine tents. Located near the foothills of the Western Ghats, Prabalmachi is a small village in the shadows of two towering peaks of Prabalgad and Kalavantin. The village often serves the base village for trekkers looking to visit the two mountain peaks. Your campsite on this trek will be located on a mountain slope surrounded by dense forests. With views of rolling hills of the Sahyadri ranges, you'll sleep in tents to wake up to a mesmerizing morning sunrise. • Spot the glowing fireflies on a trek to Prabalmachi. Travellers are required to adhere to the instructions of the tour guide during the fireflies trek to Prabalmachi. For cancellations made 10 days or more before departure of the Prabalmachi fireflies trek: 75% refund. For cancellations made 5-10 days before departure of the Prabalmachi fireflies trek: 50% will be refund. For cancellations made 0-5 days before departure of the Prabalmachi fireflies trek: No refund. The tour operator reserves the right to cancel or alter the itinerary of the fireflies trek to Prabalmachi to maximize the safety of travellers as well as staff. Arrive at the Panvel railway station by 18:15 hrs. From Mumbai, you can board the 16:51 hrs fast train from CST to Panvel. From here, you'll board shared, local transport vehicles that will take you to the base village of Thakurwadi. Begin trekking from the village and head towards Prabalmachi. You'll reach your campsite at Prabalmachi by evening and set out for a trek in the surrounding forests. As the sun sets over the horizon in the evening, you'll spot twinkling dim fireflies in the trees and shrubs. By night, you'll return back to the campsite. 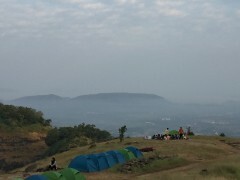 Overnight at Prabalmachi in tents. Wake up early morning to the peace and quiet of nature. Today, you'll descend back from the campsite to Thakurwadi and board vehicles to Panvel. By 11:00 hrs, you'll reach Panvel railway station, where you can board a train back to Mumbai. Your trip ends here. 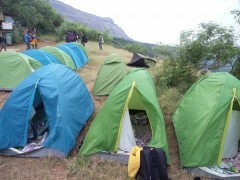 Overnight at Prabalmachi in tents. Your trip begins from Pavel railway station on 18:15 hrs. Travel to the Prabalmachi village will be arranged in shared vehicles. Today's meal package includes dinner served upon reaching Prabalmachi. You will be accommodated in alpine tents on twin-sharing basis. The alpine tents come with bedding and pillows for a restful night's sleep. Today's meal package includes breakfast with tea before departure to Panvel. You'll arrive at the Panvel railway station by 11:00 hrs. Your trip ends here. Panvel railway station is connected to the Mumbai suburban railway system. You can board a local train from any of the railway stations in Mumbai and travel to Panvel. A fast train to Panvel leaves CST railway station at 16:51 hrs.